My question is, if ears are also included among those parts which are exposed habitually by women, and thus are included in 'Ma Zahara Minha' (what appears thereof) in verse 24:31, then why not hair or head included in this. In my observation, I don't see women of any culture or region covering their hair/head habitually except for an external reason i.e. (respect for elders, for a specific custom, prayers or due to religious commandment etc). There are some truth in what you are implying. You are correct that at our time in many cultures women do not cover their heads. Please also note that even at our time in many cultures (not just Muslims) both man and women cover their heads. It is not within the scope of this website to provide data about social norms and customs and I am certainly not a sociologist however I can argue that covering the head (and not ear) for men and women was a normal custom of many societies and cultures in the past. It is in fact only a few decades that not covering the head has become more and more apparent in some societies. Please look at the available photos, paintings, movies or video documentaries made or related to a few decades ago and hopefully you will see what I mean. There is a website with the name “The American Society for the Defense of Tradition, Family and property”. There is an article in this website by Nelson R. Fragelli titled: "The Hat" dated Tuesday, 22 November 2011. The whole point of the article is to praise the wide spread custom of wearing hat and criticising those who question it at our time. "It is impossible for a hatless woman to be chic." "Cast a glance over a photograph of a crowd or a street 100 or even 50 years ago. Take a look at the men assembled, and see if you can spot any of them who aren't wearing a hat. Up until the 1960s, most men would have no more left the house without a hat than they would without trousers." 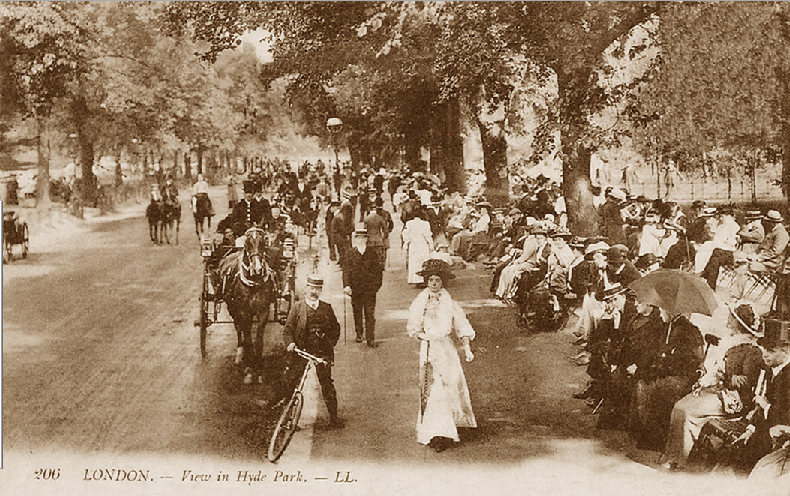 Following his advice, let us look at the following photo from Hydepark in London, 1920, how many men or women do you find who have not covered their head? I appreciate I am not providing an academically intact evidence here but I am hoping that the above quotes and observations make what I am trying to explain clearer. I am not claiming that all used to cover their head in old times. This is obviously a false claim. All I am saying is that if you were living around 80 years ago most probably you would have not written: “I don't see women of any culture or region covering their hair/head habitually”. When the Qur’an refers to ‘Ma Zahara Minha’ (what appears thereof) it is talking about a norm that was long existed before the revelation of this verse and at the time of revelation of this verse. A norm that only started to perish in many societies a few decades ago. Now the only question that remains is whether we should interpret ‘Ma Zahara Minha’ (what appears thereof) according to the time. In other words why we cannot define ‘what appears thereof’ based on the customs of a society at a time. This is indeed an interesting inquiry and I respect the fact that people may have different answers to this. If one has honestly come to the conclusion that ‘what appears thereof’ is subjective to the norms of the society then I think there are no problems if one acts based on this understanding. However we also need to hold a degree of cautious here. Many women did not cover their bosoms in Arabia at the time of the prophet (pbuh). The Qur’an however did not accept this and never included it in ‘what appears thereof’. For now, and unless I reach a diffenet conclusion based on research, I cosndier the head (hair) to be excluded from 'Ma Zahara Minha' (what appears there of) and therefore while cosnidering covering the head to be non-obligatory, cosnider covering it while using emeblishment to be obligatory for a Muslim woman. I however remain open minded about this.